To have a perfect something, one thing everyday. It could be a prefect cup of coffee, bon bon, bike ride. Today, June 12, 2017 dawned a perfect day. I will take 100 rainy raw drizzly ones to arrive at one as spectacular as today. This of course was only made better as I have pod to work in. If you happen to be in London this week, stop by EcoBuild at Excel and see Chris Sneesby's stainless steel clad pod which is on exhibit. A rare treat...you can view the archipod inventors personal pod. Little Shop of Horrors sized Plant! As if you really need a reason to buy one of these bad boys. The best reason yet comes from Amber..."I intend to use it for a relaxing space, my house has a lot of people I never get a quiet time to myself." What a way to step away from the chaos and confusion and have a little space to regroup. A visit to America's Wood Co in Washington Maine earlier this week provided us with this gorgeous cherry floor. Our intention was red birch going in, however, on the shelves was this stunning cherry, rejected from a high end yacht company, it was perfect for what we needed. We brought it back to the workshop, and proceeded to mill it. It will have a slight light brown aniline dye and clear Varathane finish over it. My early morning trolling of interesting finds on my social media feeds turned up this marvelous app~Waterlogue. My life will never be the same again, friends and family, your gifts for the foreseeable future will be my "watercolors." And for those DIY~ers out there....something very magical happens when you take a photograph of a painting and then Waterlogue it. When I Got Out Of Bed This Morning I’d Never Heard Of An Archipod… Now I Want One. Where and when we work is always changing. Advances in technology have made it possible for more people to work from their homes, on their own schedules. Those who are lucky enough to have flexibility in their work schedules could improve their work lives even more with the Archipod. The Archipod is a prefab, eco-friendly home office. It has porthole windows and a skylight on top for plenty of natural lighting. Desk space fits to the contours of the walls and its wired for all working needs. Archipodders will be able to work peacefully and quietly away from all the disturbances of the household, in the tranquility of their gardens and avoid the road-raging, horn-blowing, finger-flyings stresses of the daily commute. Essentially, the Archipod is a stress-free, tranquil place to work, all from the comfort of your own dome. Possibly it was not just the pod...I have no TV, yoga is a friend of mine, and I live in one of the most austerely beautiful parts of the world. 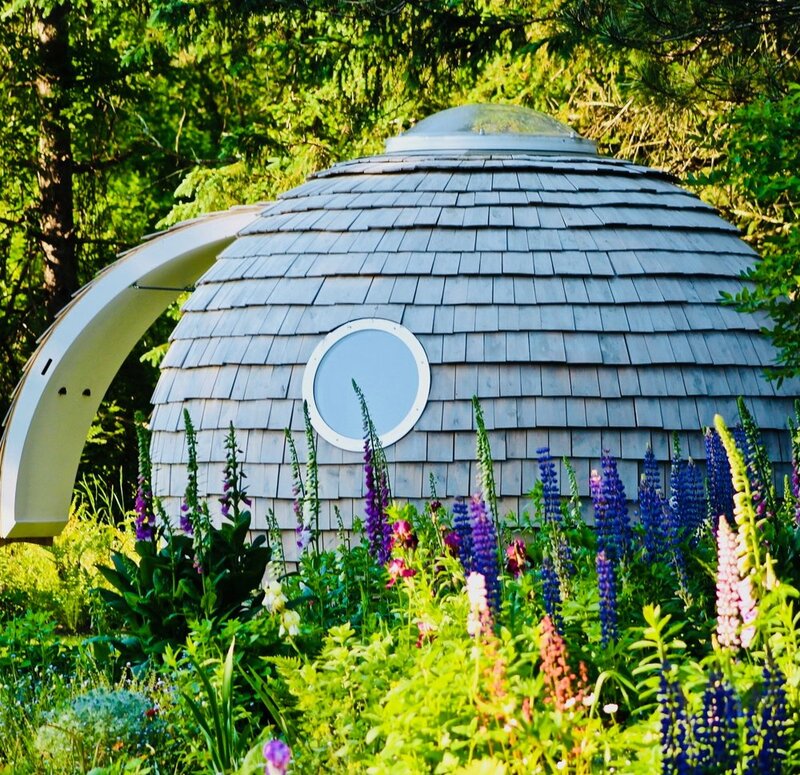 But....before the pod came into my life the name I chose for my business name was going to be "Maine Garden Pods." Not bad. But not memorable. Don't take my word for it. Own one for yourself. is one like you have never known before. Surround yourself in an original work of art. A pod nicely integrates itself into the landscape. Almost like it was always there. You'll experience a kind of serene peacefulness that can only be found in this inspirational fabulous sphere. The life changing magic of owning a pod. It's not a basket of Nutella covered kittens. But if you have a blatant disregard for right angles and want something unique, unusual and eco-friendly, look no more. A perfect place to work, play & relax. Podzook | Enriching lives one pod at a time. when you have a pod. You enjoyed that three hour commute home last night. Perhaps you were listening to John Grisham's latest novel "Gray Mountain" and you did not notice you were moving .7 miles an hour. Why? Why? Why? Would I possibly need a pod you ask? Think about this...after that enjoyable ride you arrive back home to your "mixology" pod where sweet mother of Genghis Khan there is a cocktail waiting for you.